Colgate community members gather on January 31 to hear from alumni who worked on the 4th National Climate Assessment. Four Colgate Alumni instrumental in publishing the most recent National Climate Assessment (NCA) returned to Colgate earlier this month to discuss their findings with students. The NCA is the most comprehensive and conclusive United States scientific report on climate change. The fourth NCA, released in November 2018, summarises the impacts and risks within the nation and outlines actions that regions are taking to prepare for the changing climate. Ellen Mecray ’90, David Reidmiller ’01, and Natalie Bennett ’16 presented an assessment overview and shared insights into the report’s publication. Mecray, who majored in geology while at Colgate, is NOAA’s regional climate services director for the eastern region; Reidmiller, a chemistry major, directs the National Climate Assessment at the U.S. Global Change Research Program (USGCRP); and Bennett, who majored in environmental biology, serves as the adaptation and assessment analyst for the USGCRP. The fourth alumnus involved with the assessment, Dan Barrie ’05, is the program manager with NOAA’s Climate Program Office and NOAA representative to USGCRP National Climate Assessment Steering Committee. 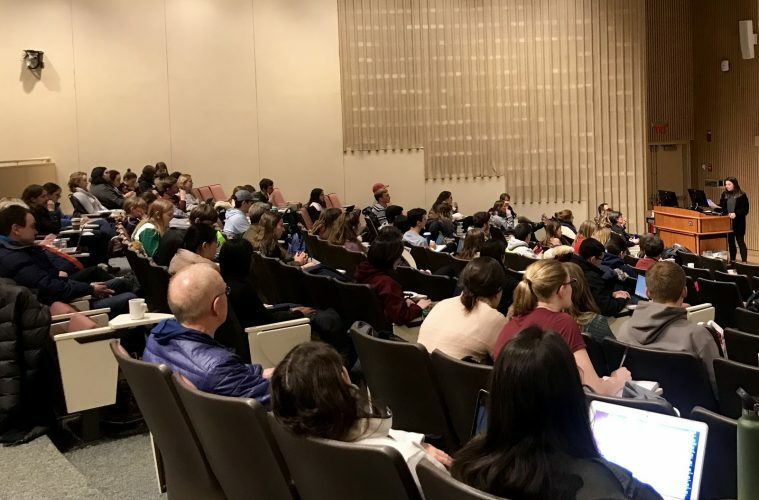 While on campus, Mecray, Reidmiller, and Bennett met with students, staff, and faculty and gave a special presentation for Climate and Society, a course that explores climate-society relationships in industrial and pre-industrial periods. Mecray also met with students in an environmental studies junior seminar to discuss her work with the NCA and how it aligns with some of Colgate’s initiatives. Environmental studies and economics major Madison Smith ’19 introduced the speakers before their talk on Thursday, moderated Friday’s discussion, and enjoyed breakfast with them on Friday morning. “I gained a degree of hope from their visit through seeing how a group of passionate people, in the midst of frustrating partisanship and the politicization of science, worked incredibly hard to release a concrete, understandable assessment about climate change in order to educate and involve the public,” Smith said. The visit was sponsored by the Environmental Studies Program, the Office of Sustainability, the geology department, the chemistry department, and the Sustainability Council.